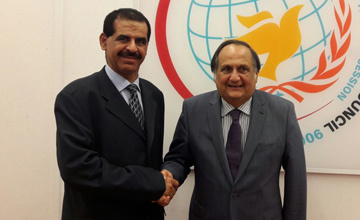 (Geneva) – Within the framework of a tour by the National Institution for Human Rights (NIHR)’ delegation to Geneva, Switzerland, NIHR President Said bin Mohammed Al Fihani held a meeting with President of the Human Rights Council and Permanent Representative of El Salvador Joaquín Martelli. Al Fihani briefed him on the achievements of the NIHR since the meeting held with the council’s President last May during a visit by the institution’s delegation taking part in Bahrain’s Universal Periodic Review meetings. He revealed to him the institution’s follow-up on the recommendations which will be endorsed in the next session of the Human Rights Council in September. The NIHR President spotlighted severing diplomatic ties with Qatar by Bahrain and other GCC and Arab countries and allegations of human rights violations resulting from that. He pointed out the campaign conducted by the National Committee for Human Rights in Qatar and its allegations about violations of basic human rights by the countries which cut off diplomatic relations with Qatar. He added that His Majesty King Hamad bin Isa Al Khalifa had issued an order to take into consideration humanitarian cases of Bahraini-Qatari families in appreciation of the Qatari people who represent a natural extension of their brethren in Bahrain. He noted that the same step was taken by the other countries and that a hotline was set up to handle those cases should they exist to preserve the family texture. Al Fihani explained that severing diplomatic ties with Qatar did not affect human rights, stressing that the institution is closely monitoring the situation to make sure human rights are not violated, in refutation of the allegations made by the National Committee for Human Rights in Qatar which claims that there is a siege which led to violation of human rights. He asserted that if there was a siege, the committee officials would not be able to move freely from one country to another. He called on the National Committee to avoid exploiting the human rights issue in the crisis which broke out due to Qatar’s support to terrorism and assume its role in working out solutions to stop funding the terrorist organisations which are violating human rights in Bahrain and other countries. Al Fihani noted that so far no Bharaini or Qatari family or individual have lodged a complaint with NIHR in connection with the repercussions of cutting off diplomatic relations. He stressed the need to focus on the main compelling reasons which led to severing diplomatic ties and work out radical solutions instead of creating more problems. The Human Rights Council President thanked Al Fihani for the account, wishing an end to the crisis on radical solutions.